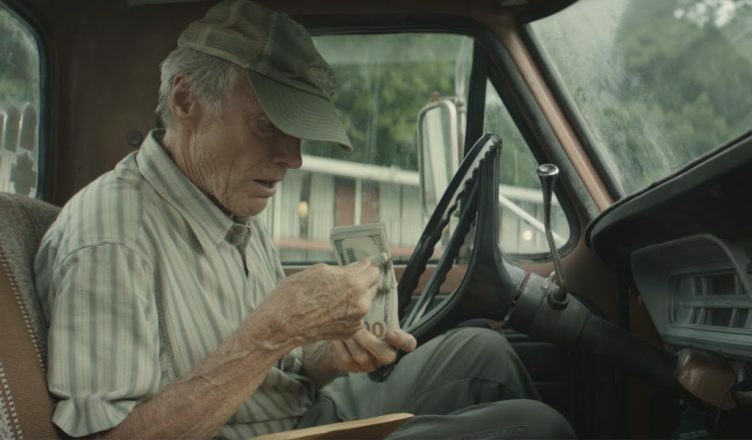 Pay day: Clint Eastwood discovers that being a drug mule is better than he expected in ‘The Mule’. Over his epic career we haven’t often seen Clint Eastwood characters step over onto the wrong side of the law. Here, however, Eastwood’s latest anti-hero hasn’t much choice. With an unusually large smile on his face and a spring in his step, Eastwood plays Earl Stone, a grower of flowers who is so devoted to his work and friends that his family barely see him. Inevitably, the unending string of missed birthdays, anniversaries, baptisms and weddings cost him dearly. His forgiving grand-daughter (Taissa Farmiga) and ex-wife (Dianne Wiest) still have time for him, but it’s his daughter (played fiercely by real-life daughter Alison Eastwood) who really resents him, not just for the neglectful childhood but for not bothering to turn up to her wedding. With the internet killing his business, Stone finds himself destitute and estranged from his family. In sheer desperation he investigates a lucrative offer to transport merchandise in his ancient pick-up truck. The guys he deals with have mean tatts and automatic weapons, but Earl treats it like a milk run. What’s in those black bags? Drugs? Guns? What does he care? After all, he’s only doing it as a one-off. Until he gets paid. Earl can’t believe it. Soon he’s in a brand new truck and raking in so much dosh he gets to save his business and save the local bar from closing. So he keeps doing the runs because his clean driving record and law-abiding persona keep the cops at bay. Meantime, a Drug Enforcement Agency task force is desperate for leads and arrests. Laurence Fishburne heads the department, charging two agents (Bradley Cooper & Michael Pena) to kick as many heads as they need to. They’re given the manpower and choppers for the job. The economy and efficiency of Eastwood’s direction only seems to improve. The Mule moves at a breezy, unforced clip, with Eastwood effortlessly switching from personal-drama mode to action-thriller mode. His love of nuance is strong as ever, most notable in the relationship between Earl and the drug dealers, which goes from hard-nosed to friendly, with Earl even asking about a goon’s nephew. Lying beneath the rising tension as the authorities slowly close in on Earl, the old adage about maintaining a sensible work/life balance gets a thorough going over, though its delivery is handled without any tub-thumping. Based on a true story and written by Nick Schenk (Gran Torino), The Mule is yet another satisfying work from a master filmmaker who blesses us about once a year with a movie. And it’s good to see his crevassed mug back on the screen. It’s Eastwood’s first acting role since Trouble with the Curve (2012) and the first time he’s directed himself since 2008’s neo-classic Gran Torino. With his love of technique serving his instincts, at 88 Eastwood just keeps going from strength to strength. Few directors of his vintage have matched his stamina, his prolificacy or his quality. May the Movie God continue to smile upon him. With an unwritten mission to win over the Deep South of America one rich racist at a time, supreme musician Dr Don Shirley (Mahershala Ali) hires New York wiseguy Tony Vallelonga (Viggo Mortensen) to act as his driver, bodyguard and unofficial cultural advisor. The supremely mismatched duo spark beautifully in Peter Farrelly’s winning, uplifting dramedy, with Mortensen, who bulked up for the role, exuding a gruff charm and pragmatic disposition that sees him pushing back against the entrenched casual bigotry of the day. Set on the eve of the Civil Rights movement, the film illustrates with several poignant scenes just how readily segregation was accepted, the “green book” of the title being a popular guide to where black people were welcome. Nominated for five Oscars, including best film, best actor for Mortensen and best supporting actor for Ali, the film has a warm, congenially progressive vibe and a wonderfully street line of humour. Those who suffer from acrophobia (fear of heights) and basophobia (fear of falling) yet enjoy having those fears pricked in the safety of a comfy cinema seat should find Free Solo enthralling. With cameras dangling alongside its subject, the film chronicles the attempt by mountain climber Alex Honnold to scale a sheer 900-metre cliff face in Yosemite called El Capitan without the aid of safety ropes. The remarkable photography captures the extreme danger of the enterprise, constantly emphasising the straight drop, yet the real drama is the effect his relationship has on his ability to focus. A perfect treat for the armchair adventurer. Those infatuated by the supernatural works of M Night Shyamalan – and they are many, be in no doubt – will surely find this unplanned, long belated mashing of Unbreakable (2000) and Split (2016) a work of pure art. Those, however, who hold Shyamalan’s body of work to be essentially twist-loving thriller pulp – consider The Sixth Sense, The Village, The Happening, The Visit, The Lady in the Water, and forget The Last Airbender and After Earth if you can – should still be able to enjoy the unintended silliness as Samuel L Jackson, Bruce Willis and James McAvoy (in full-on ham mode as the nutcase with multiple personalities) are drawn into a serious consideration about whether superheroes can be a real thing in the world. The Sixth Sense, The Visit and Split showed that Shyamalan has real talent as a director of suspense, and there are sparks of that here, yet the film strains for your attention and stumbles with a very awkward ending. Powerhouse performances from Saoirse Ronan and Margot Robbie drive Josie Rourke’s searing chamber piece about one of history’s greatest catfights. As cousins, Mary, Queen of Scots (Ronan) and Queen Elizabeth I (Robbie) put a veneer of civility over their increasingly curt war of words about who rules over whom in 1500s Britain where Scotland and England are on the brink of civil war. Perfectly accented and with brow-curling conviction, Ronan rules the frame here with strong support from Robbie. There are no sweeping battle scenes, yet the impressive, verdant landscapes and cavernous building interiors keep the film from looking like a theatrical two-hander, something Rourke – a veteran stage director making her first film – no doubt strove for. The film has been Oscar-nominated for hair, costumes and make-up, which managed the extraordinary feat of making Robbie look ugly. The idea of remaking Storm Boy, one of Australian cinema’s most beloved and successful movies – its $2.6m take back in 1976 amounts to around $17m today – might sound like sacrilege. And it would have been, too, had director Shawn Seet, writer Justin Monjo and their producers stuffed it up. Thankfully, their version of the Colin Thiele’s 1964 book about the relationship between a pelican and the son of a beach-dwelling hermit not only compares favourably with the original, it often outdoes it, offering more story and substance. As wonderful and poetic as the original is, a fresh screening reminds you of how visually driven and understated much of the film is. It’s almost a wisp of a movie, beautifully filmed and graced with lovely performance by Greg Rowe, Peter Cummins as his father and David Gulpilil. The new film stages things a little more dramatically. It casts the story as a flashback told by an ageing corporate exec Mike (Geoffrey Rush) to his grand daughter Madeline (Morgana Davies). She, like many in the community, is angry that his company, which she is soon to be part of, wants to develop the beach where Mike raised three pelicans as a child with his dad (Jai Courtney) and indigenous friend Fingerbone Bill (Trevor Jamieson). It’s a fine, handsome film, almost perfect family fare. Side note: The heat usually associated with the issue of remaking classics needs to be taken down a few notches. There have been good TV versions of classics such as Picnic at Hanging Rock, The Devil’s Playground and Wake in Fright and the culture seems to have survived. And it’s not as if a remake negates or overwhelms the original, unless it’s a remake of an inferior film, as was the case with Ben-Hur. Somewhat over-long but enjoyable action-adventure rehashing of the Arthurian legend set in a working class high school where a bullied boy Alex Elliot (Louis Ashbourne Serkis) pulls the magical sword Excalibur out of a block of concrete and discovers he is destined to fight an evil witch intent on crushing civilisation. The film’s mid-section where Alex and his team head out on their quest drags the film to a crawl, but things pick up once Merlin (a wonderfully fizzy performance by Angus Imrie) shows up to aid them. A strong anti-bullying theme helps spice a nifty, FX-driven kid’s adventure. Very likeable, truth-based comedy about middle-aged American couple Pete and Ellie (Mark Wahlberg and Rose Byrne) who try to fill the void in their lives by adopting three siblings. Based loosely on his experiences, director/writer Sean Anders (Horrible Bosses 2, Daddy’s Home 1 & 2) moves swiftly through the detailed preparation process and the inevitable honeymoon period, spiced by the performances of Tig Notaro (a well-known comic in the US) and Octavia Spencer as a couple of helpful social workers. The film’s dramatic payload hits when the oldest daughter (well-played by Isabela Moner) begins pining for their real mother (a drug addict) and starts competing with Ellie. It’s a turn of events that gives what would otherwise have been a run-of-the-mill family comedy a strong, serious edge. The outcome is very well-handled. Wahlberg, who Anders directed in Daddy’s Home 1&2, produced the film, so Anders can’t be faulted for his networking abilities.